Throughout his entire life, Pramukh Swami Maharaj has untiringly remained in the service of society. In times of adversity he has assisted society, and in times of peace he has strengthened society. His every moment is lived for others, without distinctions of caste, nationality or faith. Distinguished world leaders and dignitaries have praised Swamishri’s outstanding contributions. The following is a brief overview of some of Pramukh Swami Maharaj’s spiritual and social works. 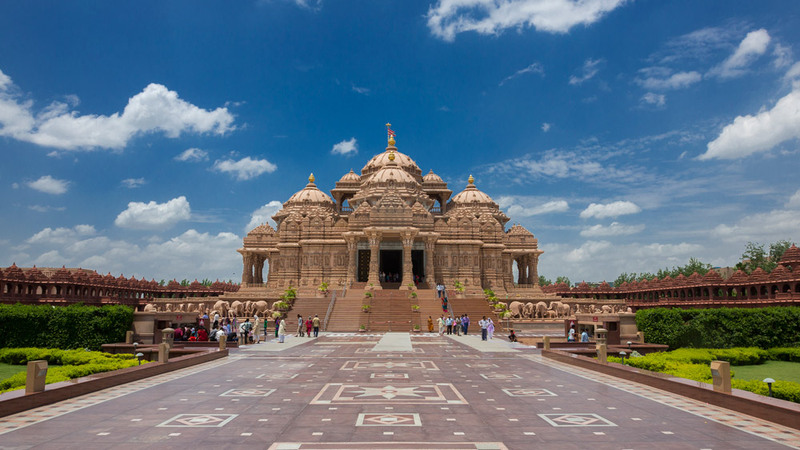 The Swaminarayan Akshardham complexes in New Delhi and Gandhinagar, inspired and created by Pramukh Swami Maharaj, have become landmarks of Indian culture. The Akshardham complexes are expressions of purity, values, love, sacrifice, faith, effort and dedication. They are dedicated to Bhagwan Swaminarayan and portray the glorious heritage of India. 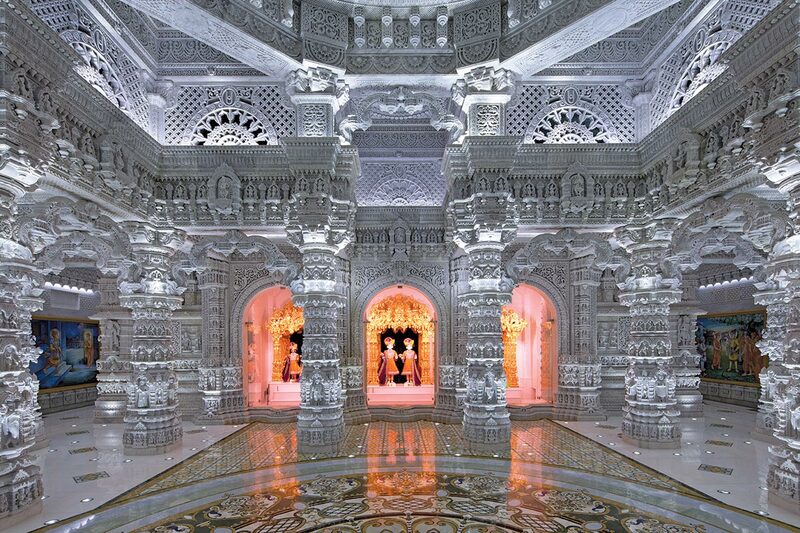 The Akshardham complexes have also gained a special place in the hearts and minds of its countless visitors. These complexes inspire purity and harmony in hundreds of thousands of visitors each year. Future generations will bow in salutation to Pramukh Swami Maharaj for gifting these inspiring cultural complexes. A mandir is not merely a venue for ceremonies and rites. It serves as a place where spirituality, social services and culture flourish. Pramukh Swami Maharaj has revived the ancient tradition of mandirs by constructing over 1,100 mandirs in tribal villages to metropolitan cities. 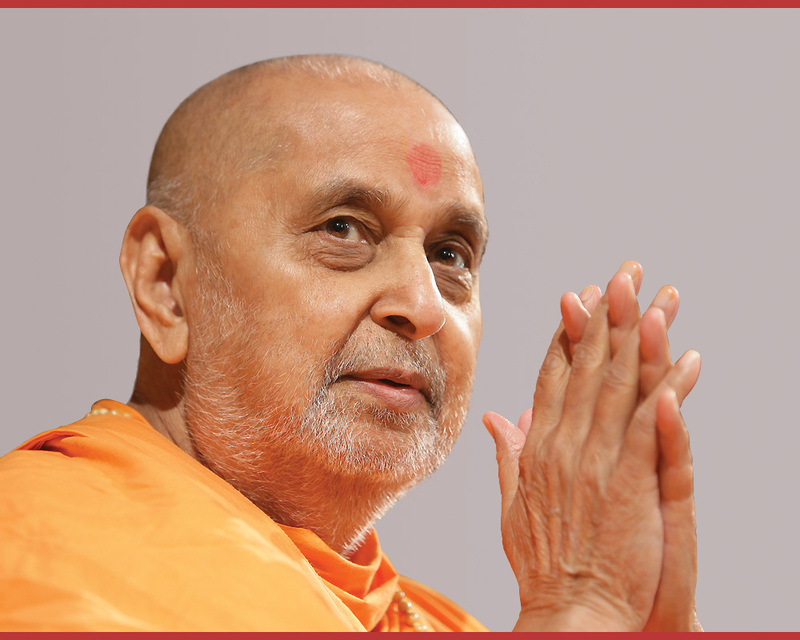 Pramukh Swami Maharaj has propagated the eternal Vedic philosophy as propounded by Bhagwan Swaminarayan to establish peace and happiness in the hearts of many. He has ignited spirituality and culture by constructing traditional mandirs in India and across the world. These mandirs proudly represent the greatness of Indian spirituality and culture. Countries include: India, Kenya, Uganda, Tanzania, South Sudan, South Africa, Malawi, Botswana, UAE, Bahrain, Portugal, Belgium, UK, Canada, USA, New Zealand, Hong Kong, Singapore and others. There are three foundational pillars of Indian culture – scriptures, mandirs and sadhus. Pramukh Swami Maharaj has strengthened all three of these foundational pillars in many ways. Of these, he has inspired 1,000 educated youths to renounce the world and gifted society with a pious cadre of sadhus. 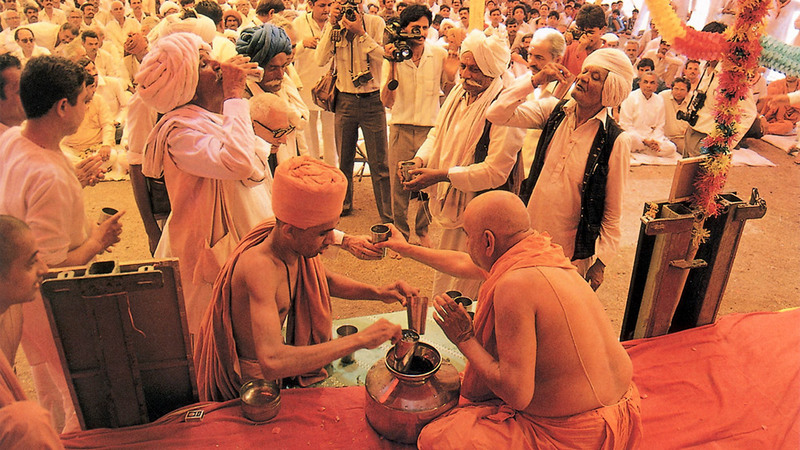 These sadhus are highly respected in society. To nurture their spirituality, Pramukh Swami Maharaj established the BAPS Sadhu Training Centre in the holy village of Sarangpur. This training centre has been active for over three decades. After the great spiritual teacher Adi Shankracharya, Pramukh Swami Maharaj is widely acclaimed by spiritual leaders for inspiring youths to live as renunciates for the uplift of society. Education is not merely for earning money to sustain one’s family, but also for encouraging inner progress in life. Therefore, Pramukh Swami Maharaj has established educational institutions to help bolster this union of values and education. From establishing student hostels in tribal villages, to a renowned school in England, these educational institutions by BAPS provide an environment for students to progress in their academic careers and to also develop students as contributing members of society. These educational institutions created by Pramukh Swami Maharaj will benefit youths for generations to come. Whether it was a drought or a flood, a tsunami or an earthquake, Pramukh Swami Maharaj’s compassion and selfless services has reached out to those in misery. During such natural disasters, through various relief service programmes, Pramukh Swami Maharaj’s helping hands have assisted hundreds of thousands of people, providing them comfort and support. Pramukh Swami Maharaj’s helping hands have provided relief to victims of natural disasters in Orissa, Tamil Nadu, Maharashtra, Gujarat, Nepal, Africa, Japan, USA and other places. Pramukh Swami Maharaj has adopted many villages and joined hands with locals to rebuild communities and reestablish normalcy. In addition to this, he has ensured that these villages were restored with schools, water tanks and health clinics. These selfless efforts and sacrifices by Pramukh Swami Maharaj has inspired thousands of people and given them a new life. Pramukh Swami Maharaj has kept alive the illustrious tradition of support for the underprivileged initiated by Bhagwan Swaminarayan. Swamishri has selflessly served and showered his love on them and guided them to lead pure, pious and productive lives. He has frequently visited their huts and inspired them to quit their addictions and superstitions. He has encouraged and facilitated their education, enabling them to raise their standard of living and hold their heads up high with pride. 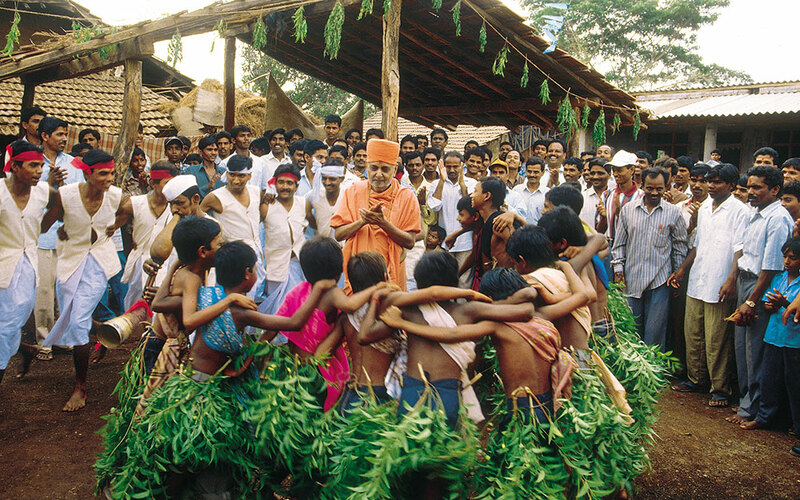 Thus, the tribals rejoice and dance with delight in celebration of the new lease of life that Swamishri has given them. 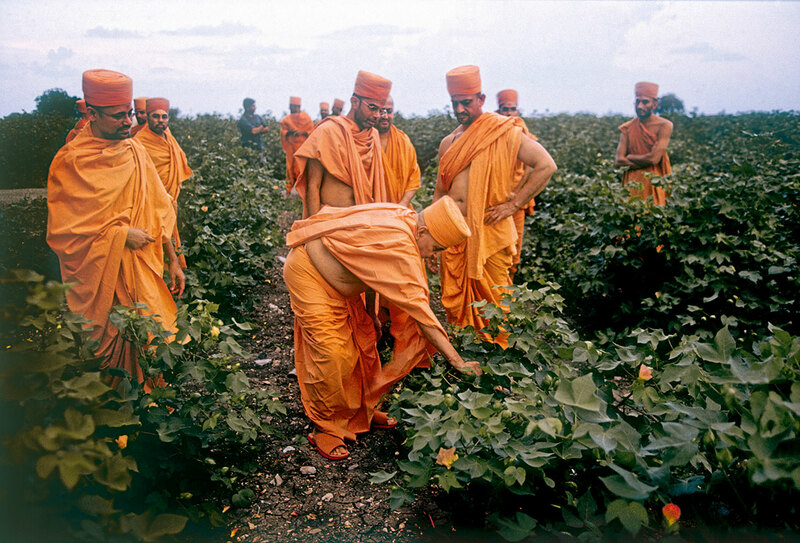 Many people have experienced life transformations in Pramukh Swami Maharaj’s pure presence. Many have shed their atheistic beliefs and become theists. Chronic addicts have quit their addictions. Countless have overcome their innate base natures and rectified themselves. 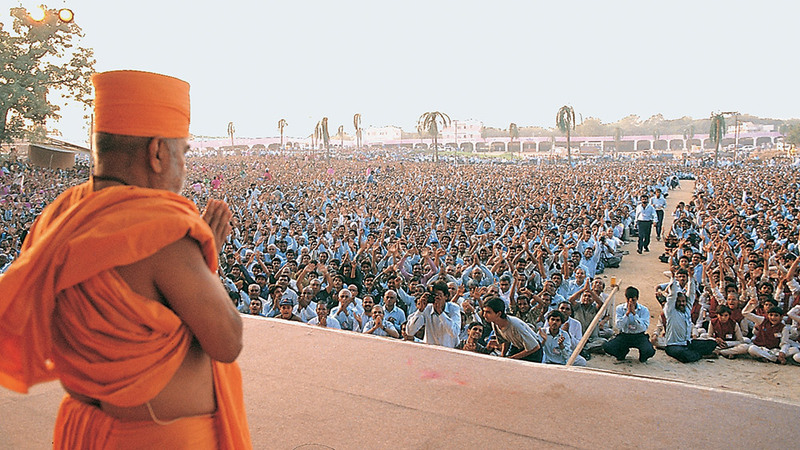 Pramukh Swami Maharaj’s divine inspiration has helped thousands of aspirants live a life of morality and spiritualty. He has resolved conflicts and reinstated harmony in innumerable families. He has restored peace between communities who had harboured animosity towards one another for generations. And he exemplified forgiveness and peace during the attack on Gandhinagar Akshardham by inspiring peace among people and within society. Addictions are among the worst problems faced by the world today. The terrible consequences of addictions are evident everywhere. Pramukh Swami Maharaj has personally counselled thousands to give up their harmful addictions. He has inspired large de-addiction campaigns to spread the message of an addiction-free life. 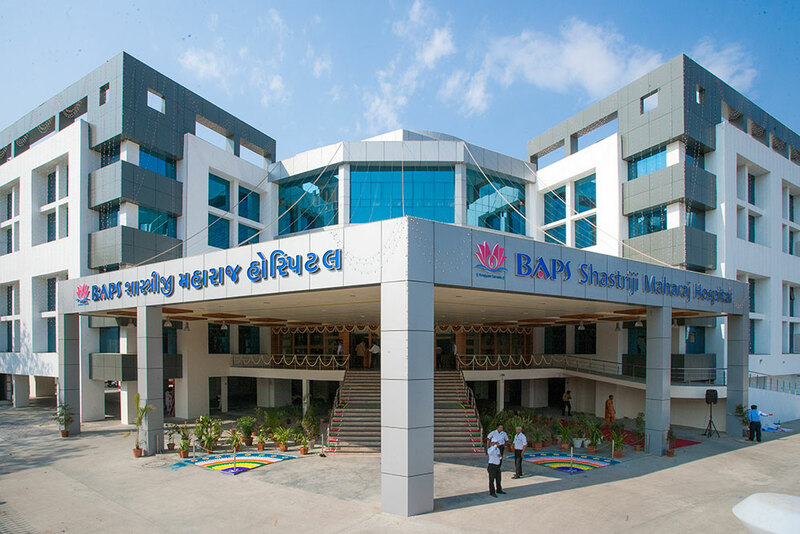 BAPS youths and children have conducted these efforts, inspiring millions of people to live an addiction-free life. These youngsters have also organized large campaigns at schools and colleges to spread this message. Pramukh Swami Maharaj has organized many forms of medical services to help the needy. Each year, BAPS mobile clinics treat hundreds of thousands of people free of charge in tribal and rural areas. Pramukh Swami Maharaj has inspired hospitals, dispensaries, health fairs, medico-spiritual conferences and other health-related services. Pramukh Swami Maharaj has taken great interest in harvesting rainwater and caring for the environment by constructing check dams, ponds and lakes, irrigating lands, building underground water reservoirs and planting trees. He has also championed the welfare of livestock, ensuring appropriate facilities for their care. His efforts have led to the construction of 5,500 wells in the villages of Saurashtra and planting of over 2 million trees worldwide, directly empowering people to improve the environment. In addition, he has promoted the use of clean energy by using solar panels. Pramukh Swami Maharaj has dedicated countless hours to promote family unity. He has worked tirelessly to establish harmony amongst family members, urging them to forgive, understand and appreciate one another. To facilitate this, he has initiated the practice of ghar sabha – the daily gathering of all family members. 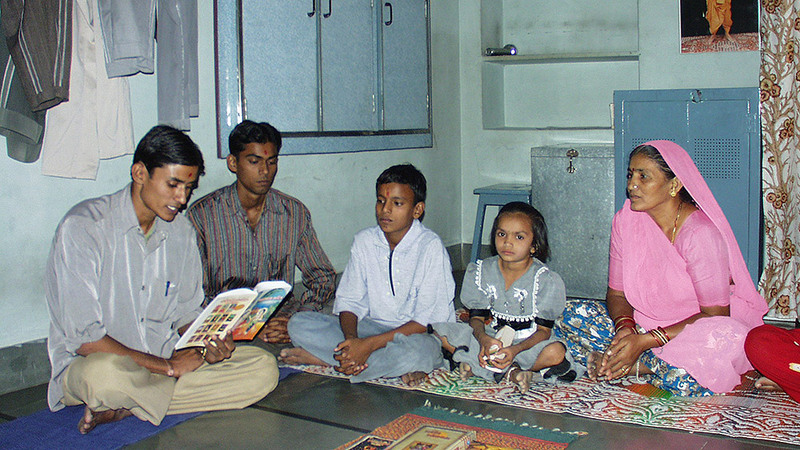 Ghar sabha provides a platform for all family members to read or discuss spiritual ideas and family issues. He has also encouraged families to eat and pray together. Such daily communication and interaction gives family members a better understanding of each other’s spiritual, physical and emotional needs. These initiatives have helped to bridge the generation gap between family members. They learn to support one another, forgive one another, let go and trust one another, thus increasing family unity. Pramukh Swami Maharaj’s insistence on ghar sabha has resolved many problems, establishing peace, harmony and happiness in countless families. Established by Yogiji Maharaj, the Children’s Activities have been enthusiastically nurtured by Pramukh Swami Maharaj. Every week, in India and abroad, trained volunteers conduct more than 7,000 children’s assemblies and activities promoting faith, values and education. These activities continue to nurture hundreds of thousands children into responsible and productive citizens. Culture, education, health, skill development and spirituality are the five areas that Pramukh Swami Maharaj has primarily focused on for child development. 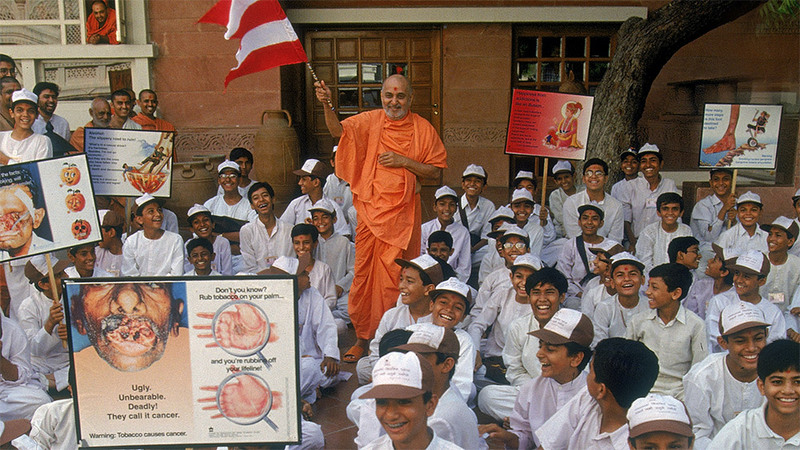 Through his selfless love and compassion, Pramukh Swami Maharaj has developed a strong youth force in India and abroad. Pramukh Swami Maharaj has channelled the energy and passion of youths into constructive activities that benefit them and society. These activities help to preserve culture and heritage, and promote character, skill and spiritual development, enabling youths to become noble citizens and contribute back to their communities. Among Pramukh Swami Maharaj’s priceless gifts are the satsang sabhas (spiritual assemblies) that take place weekly at BAPS centres across the world. In this hectic age of modern technology and busy schedules, satsang sabhas provide much needed spiritual guidance and relief in stressful times. These sabhas have also blessed countless individuals with inner peace. Through satsang, people develop patience, positivity, tolerance, cooperation, respect for all, and many other virtues that are useful in daily life. Countless individuals, both young and old, men and women, regularly attend these weekly satsang assemblies to improve and enlighten themselves. Bhagwan Swaminarayan endeavoured for the progress of women by promoting their educational, social and spiritual development. Through BAPS, Pramukh Swami Maharaj has inspired many activities for girls and women of all ages and backgrounds in India and abroad. From tribal villages to metropolitan cities, the activities coordinated by the BAPS Women’s Wing have flourished, providing opportunities for women to develop culturally, educationally, professionally and spiritually. Sanskrit is the language of the Hindu scriptures. To preserve the language, and facilitate deep and accurate scriptural study, Pramukh Swami Maharaj has encouraged sadhus to study Sanskrit. These scholarly sadhus have contributed to the spiritual literature by producing academically acclaimed works in Sanskrit. For example, with the inspiration of Pramukh Swami Maharaj, BAPS sadhus have written a detailed exposition on the Prasthantrayi in the age-old Vedic tradition. 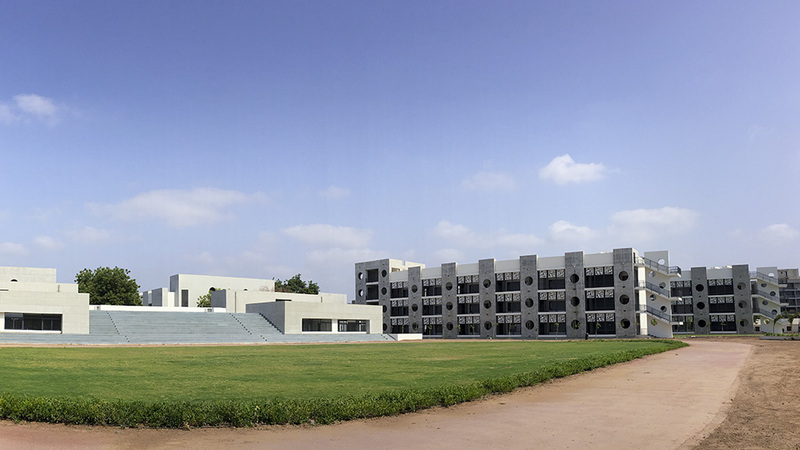 To enable such detailed study, Pramukh Swami Maharaj has created academic centres such as AARSH in Gandhinagar and BAPS Swaminarayan Research Institute in New Delhi. Pramukh Swami Maharaj is a pioneer in creatively combining spirituality and modern technology to convey the timeless truths of Sanatan Dharma. 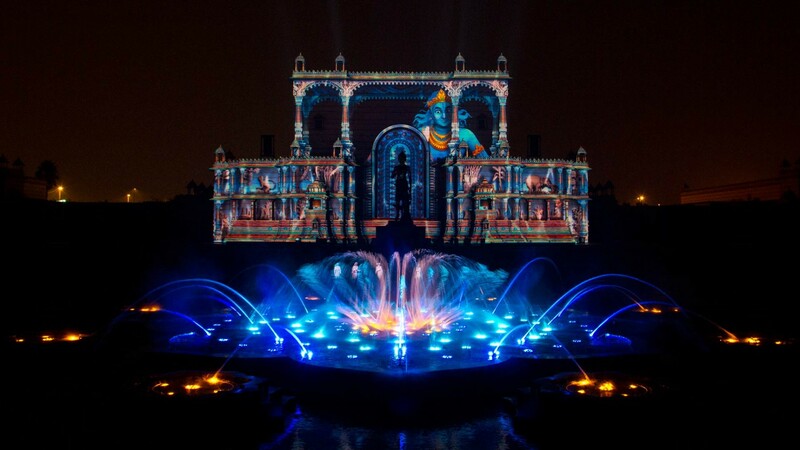 Through robotics shows, a cultural boat ride, laser shows, the ‘Mystic India’ Giant Screen Film and others, Pramukh Swami Maharaj has adopted modern technology to portray spiritual messages in an entertaining and enlightening way to people of all ages and backgrounds. Renowned and expert managers and administrators are awed by Pramukh Swami Maharaj’s calm, effective and proficient management of the BAPS Swaminarayan Sanstha’s wide range of socio-spiritual activities. 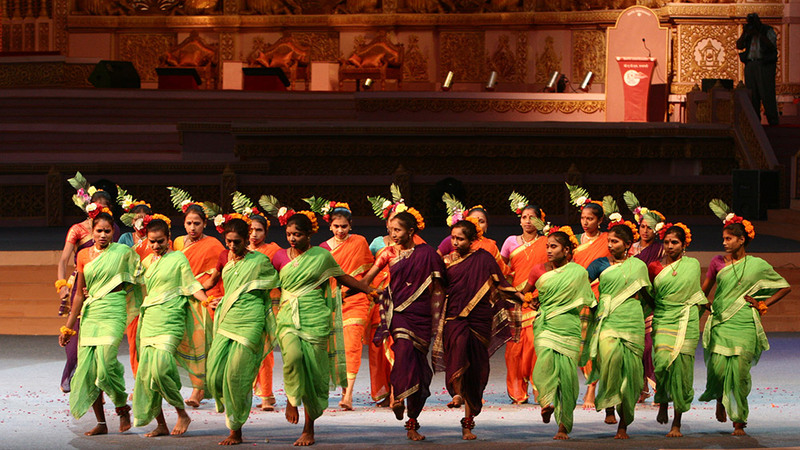 Through large festivals and events, such as the month-long Cultural Festival of India celebrations in the USA and UK, grand bicentennial celebrations in India, children and youth conventions, inaugurations of mandirs, and other occasions he has enabled one and all to learn and practice such management skills. Pramukh Swami Maharaj has revived ancient Indian art and architecture by creating exceptional monuments, giant mandirs and exhibitions in India and abroad. 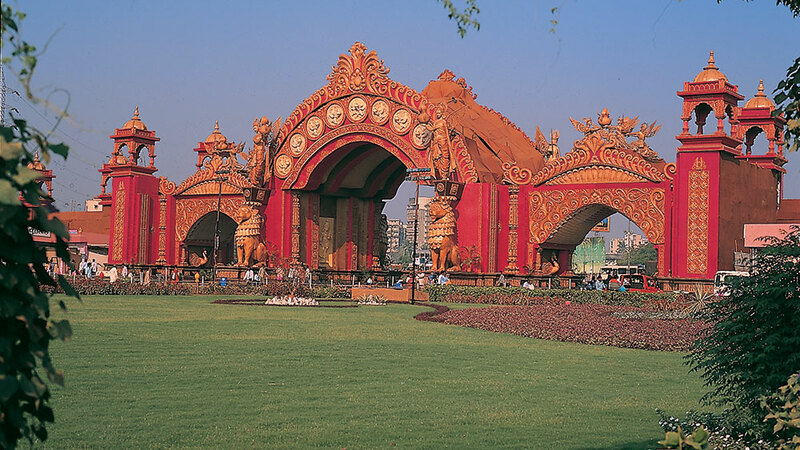 The beauty is not simply in the architecture of these mandirs and the renowned Akshardham cultural complexes in New Delhi and Gandhinagar, but also in the deep inspiring spiritual messages conveyed by each carving, painting or sculpture. Countless individuals from India and abroad have been inspired by these creations.